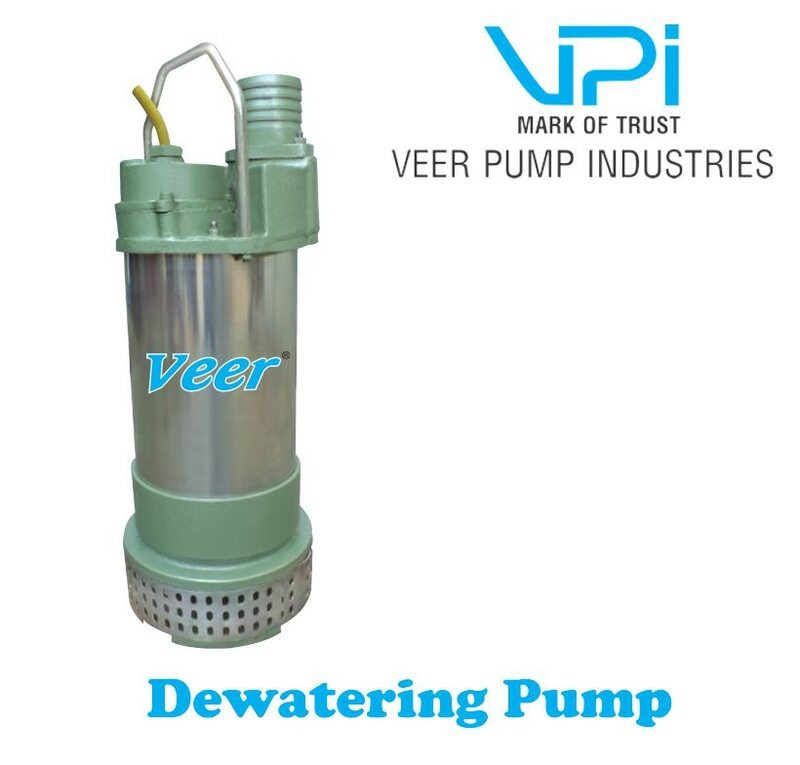 Veer Pump Is Manufacturer Of Dewatering Pumps. Dewatering Pump Manufacturer in Ahmedabad. "VEER" Dewatering Drainage Electric Submersible Pumps are Designed to Reach Places Where Other Pumps Can't go. They Are Light In Weight Which Make Handling & Installation Simple. Pump And Motor Are Fitted on Single Shaft. Vertical Construction Motor above and pump below ensure to remove maximum dirty water from the pit. Low Maintenance cost and easy to repair with better life. TECHNICAL SPECIFICATION :- Motor : Two Pole Continuous Duty Squirrel Cage Sub. Type Induction Motor Speed : 3000 RPM Connection: DOL (STAR DELTA Optional) Range : 1.0 H.P. to 50.0 H.P. Temp : Ambient (Also available for higher temp. on request) Voltage :220 V, 1 Phase, 50 Hz. (1 H.P. to 2 H.P.) 415 V, 3 Phase, 50 Hz. (1 H.P. to 50 H.P.) Insulation : Class F Protection :IP-66 MATERIAL OF CONSTRUCTION :- Motor Body :S.S. 202 Cooling jacket: S.S. 202 Bypass:C.I. IS 210 F626D Shaft:S.S. 410 Impeller:C.I. IS 210 F626D Strainer:S.S. Fasteners:S.S. Cable:PVC Insulated Double Sheathed Copper Conductor Round Flexible Cable Mechanical Seal:TC Vs. TC Optional MOC Of S.S., Aluminium, Bronze, available on Request. APPLICATION :- Building & Construction Underground utilities Mining Quarries Industries Tunneling Flood relief Dry Dock/Off shore Power/ Steele Plant AVAILABLE ON REQUEST :- Float Arrangement in Single phase pumps Supplier in : Ahmadabad, Surat, Vadodara, Rajkot, Anand, Bhavnagar, Jamnagar, Kheda, Junagadh, Navsari, Rajkot, Kutch, Bharuch, Porbandar, Mehsana, Kutch, Somnath, Surendranagar, Valsad, Vapi, Panchmahal, Banaskantha, Bharuch, Patan, Dahod We provide service on our products in regions of Gujarat.